Thus, after sending the application, those candidates who applied are eagerly waiting for the hall tickets to be released soon since then. As per the official notification, the admit cards are going to be published soon on the official web portal. Thereafter, the applicants can download the same via the direct link provided below. The authority to maintain and regulate the direction recruitment to fill the vacancies created every year, is Odisha Staff Selection Commission in the state. All the responsibilities like generating the notification, conducting exam, publishing result, etc. is done by it. As it works out each year, the same is done by it this year too. This time, there are a total number of 288 posts (Junior Clerk) and Junior Assistant (129 posts) for which the notification has been released. The eligible candidates have applied for it and now they are waiting for the roll numbers to come out soon. The Prelim written exam will for the above said vacancies be conducted on February 14 this year. So, in view of that, the admit cards will be made available before the above-mentioned date. Thus, the candidates will be able to download it with enough time beforehand. After downloading it, candidates should take a printout for their future reference as it is compulsory to bring it in the examination hall. Without, the entry is prohibited. The selection procedure/process will be based on the applicant’s performance in prelims, mains, and interview. The eligible candidates will be called for next stage once they have cleared the last stage in which they qualified. After the interview round, the selected applicants will be hired at various departments position in the different departments. First of all, look out for the official website of OSSC or simply visit the direct link mentioned below. Then, look for ‘OSSC Jr. Clerk/Jr. Assistant admitcard 2016’ link. Now, you will be asked to enter some important details like User ID and password. Enter the required fields and click on ‘Submit’. The next screen will come up with your ‘admitcard’. Save it and take a printout as it will be needed in the further process. 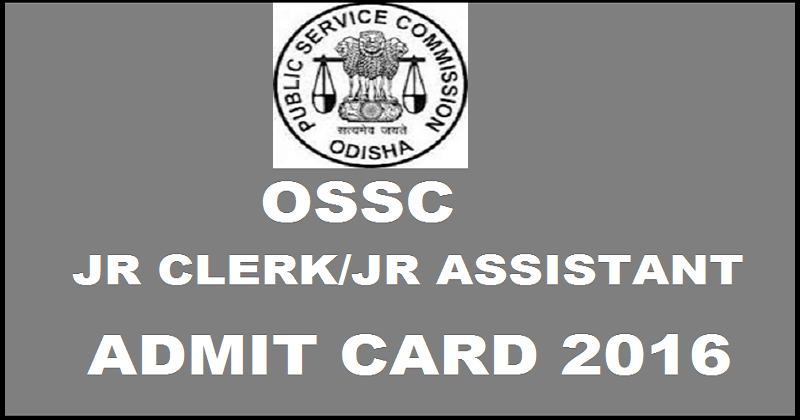 Click here: To Download Junior Clerk/Junior Assistant 2016 Admit Card.